Today marks the much anticipated grand opening of the Tesla Gigafactory. Earlier this week, CEO Elon Musk, along with CTO J.B. Straubel and Panasonic VP Yoshihiko Yamada participated in a very telling press conference. Update (July 29th): Tesla has now completed its grand opening tourof the Gigafactory – check here take the full livestream walk-through yourself! Topics covered included the Gigafactory, of course, but also Panasonic’s role, battery format, the Model 3, and Autopilot, among much more. Below are some highlights from the lengthy conversation. 43 Comments on "Highlights From Tesla Gigafactory Press Conference Featuring Musk, Straubel, Panasonic VP"
..I’ve never seen where “survivorship bias” could be taken so literally. Bias the people who still want assault weapons in hand of crazy people after 1200 shoot dead people last year. Of course no one would say yes. It’s especially dumb considering the driver has to purposefully engage it. So if any driver didn’t trust it, they would simply choose not to use it. No reason to have it removed. Thank you. That’s the most important point. Also, thank you for using the type II conditional sentence structure correctly. This is what I thought he was going to announce in Master Plan 2. IMO it’s way, way, way too soon to know whether / when / to what extent / how it makes sense to go into grid services, or even just making money off the SC network, rather than simply using them to sell more physical products (cars / powerwalls / solar systems). Even if Musk is sure it will make sense eventually, there’s no upside in saying it out loud now. Tesla management (and musk even more so, with SpaceX), are trying to do too many things at once as it is, and sp;litting management attention at a critical time is stupid. All they need to do is makme sure that their current business models / contracts don’t prevent them from doing it later on. It took Apple years before it made any money from the iTunes Store, and even though I’m sure they were aiming for it eventually, they took pains during the first years to say they were just covering costs and using it only to expand device sales. At this point, grid services is the only way to make an economically viable argument for residential batteries. Build a really smart battery that the utility can tap into for peak demand, frequency management, “duck neck” support, demand-response, etc. It’s pretty difficult to let the genie ( Autopilot ) ouf of the bottle – give it to your customers and then take it back. It’s a toy for people, and they enjoy it’s novelty. They did good to trademark the name Autopilot, but they erred in using it so early. Autopilot certainly suggests a fully autonomous mode to give relief and relaxation to the driver. Thus, the guy asleep on the video, and the dead guy who was watching a movie, and on and on. Imagine the uproar if Tesla DID remove Autopilot functionality from existing customer’s cars! It would probably result in riots and picket lines. It’s a parlor toy first – and it does have legitimate safety functions as part of it’s suite of features. The other shoe hasn’t dropped yet where a Tesla in summon mode kills a dog, cat or human. People just get into so many diverse situations – like, what engineer could have predicted the truck trailer incident? The number of variables seems infinite. This is why autonomous features will remain a legal nightmare and thus a “parlor trick” for good, in my opinion. I disagree completely. If one knows what an actual auto-pilot does, then one wouldn’t think that it’s complete autonomy. What if summon kills someone? Summon requires human input, which by definition means someone has to push and hold some button, then agree to something, then push the button again. Plenty of opportunity NOT to crush someone. You appear to think that some Autopilot feature caused the accident, when it appears to me that overly cautious settings or lack of additional features, failed to prevent or reduce the severity of the accident. But make no mistake, the human element was the initiator, whether from fatigue, poor judgment, or simple failure to follow instructions, in every accident I’ve seen so far. Autopilot, Drivepilot and the other semi autonomous systems out there, may seem to some to be toys, but they’re the precursors to a huge shift in the driving paradigm, and I believe, here to stay. You’re right about the key fob Pushmi, I was thinking just of the phone app. Thanks for pointing that out.? 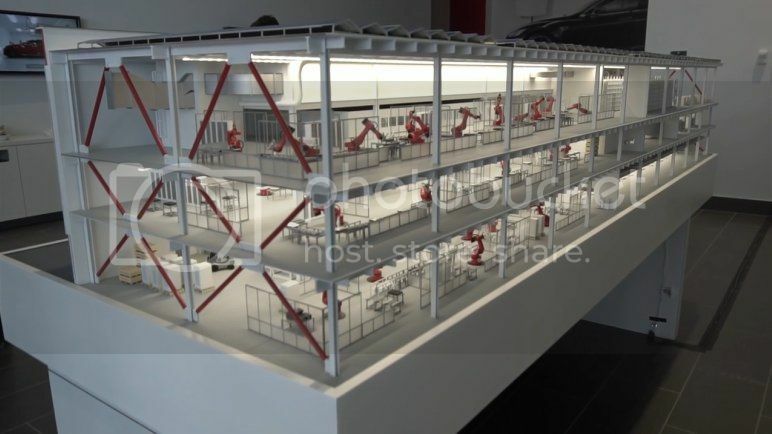 I thought the Gigafactory was just going to be 2 stories, but looking at this model, it appears to be 3 stories. They’ve been saying “two stories” right along, so indeed this is surprising. I saw a mention of it being 3 stories just a day or two ago, in a comment on another InsideEVs article, but I thought that was an error. I wonder if it’s going to be two stories in certain areas where they need a high ceiling on the first floor, and three stories in areas where they don’t? At any rate, I see no evidence they’ve raised the height of the roof, so it seems to be just a matter of choosing how to divide up the internal space, into 2 or 3 stories. If the roof is 35 feet up, and 8 feet is your average height per story, then this is easily, a 4 Story tall building! However, in the model, it seems to be 10-12 feet, or more, per level in 3-Story configuration, and will likely be 16-18 feet per floor in 2-Story configuration, with variations in floor thickness, for how big the HVAC requirements are! I think Robert is correct; any reference to “four stories” likely refers to the height of the Gigafactory building as compared to a normal office building, where 35 feet would most likely be divided up into 4 stories. The height of the building is 71 feet. Depending on what is needed, sometimes it is 2 stories, sometimes 3, and sometimes 4. So they are going to use 21700 cells instead of 20700 cells like they have always said? The NCR20700A cells has already been used for a long time now in Metabo’s LiHD power tool batteries. And Bosch has also announced new power tool batteries coming this fall using 20700 (or 21700?) cells. Currently Tesla use Panasonic NCR18650B cells for model S and X, so I would have though they were gogin to use the rather new Panasonic NCR20700B cells for Model 3. In the same topic you can also find datsheets for the Panasonic/Sanyo NCR20700A/B cells. Thanks for this image. I believe that 21700 with presented parameters (4750mAh) is for this time only a Samsung’s dream. Exactly as announced 120Ah prismatic module for BMW i3. One thing confirming my assumption is that this 21700 cell do not have designation for serial production unlike the INR18650-35E (3500mAh) which is already in production. 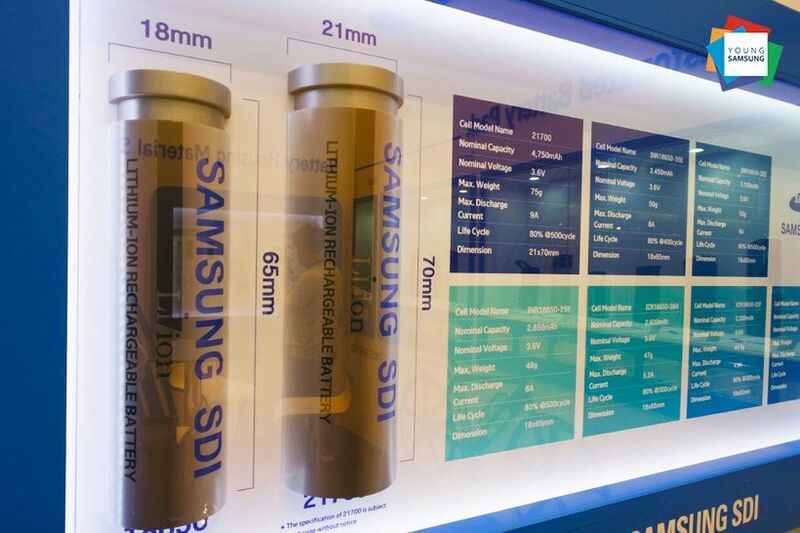 The second thing is that only Samsung’s 21700 cell in serial production is INR21700-30T with 3750mAh and I believe that it is the only one 21700 cell in serial production at all (From what I know Panasonic already producing 20650 and 20700 formats only, LG is producing 20650). I’m pretty sure you won’t find any case where any Tesla spokesman ever said “20700 cells”. That is an interpretation of exactly one mention of “20mm by 70mm” cells; a single quote which has been seized on, paraphrased, and endlessly reported as if it was Gospel… which obviously it wasn’t. Perhaps it was just an estimate in round numbers. You’ll note this report doesn’t actually have any Tesla spokesman saying “21700 cells”; again that’s an interpretation. Possibly that’s correct, but let’s wait until Tesla actually makes an official announcement of the form factor before we start assuming it’s set in stone. Given the volume that they are pushing for, they can probably make whatever size they want and be able to match, or beat, the cost of the “new” standard, mass-produced 20700 cells. The fact that they limit the diameter of the cells to 18 or 21 mm seems due to cooling requirements since the cell heat has to conductively travel through the cell from the inside towards its surface where the cooling loop collect it, but why do they limit to such a small hight of 65 or 70 mm? It would appear that a higher hight would be beneficial for overall pack energy content since 80 or 90 mm would still be acceptable on the bottom thickness of the car. That’s one genuine question I have that I never found a real clear answer on. I wondered that too, since I seem to remember seeing an artist’s rendition of the Tesla battery pack, and the battery cells were stacked in multiple layers. It could be that twice as tall would be too tall for the diameter they want. And more than 70mm might be too tall for the number of layers they want. I thought the entire battery pack is about 3-4 inches tall. That doesn’t give much room for the interconnect, shielding, cooling and other battery packing need. So, I doubt that it would be double stacked or taller. Perhaps that was for the Tesla Roadster, where the battery pack was block-shaped and indeed the battery cells were stacked in layers. It’s not clear to me if they were sacked in there upright or laid flat, but since the arrangement was described as “sheets” and “pages” I’m guessing they were flat. Contrariwise, in the much flatter Model S/X battery packs, the cells are arranged in an upright position in a single layer (photos in the link below). Why not longer? Take a look at BMW i3. The prismatic cells in that one are about 15 cm high (+ connectors). Note the impact on the hight of the car. The article is titled: Tesla Gigafactory: new building permits show $63 million in latest expansions, new battery module lines. In other battery news, Sony is selling their battery division to Murata. Sony is the company that first commercialized the Li-ion battery in the early 90s. Looking that that picture of the 3 guys . . .
Hmmmm … are you referring to the fact that one is a multibillionaire while the two others are merely multimillionaires? I want to know how they have changed the fairly standard production machines. Argon studied all of it and broke into basic steps. How has Tesla changed the manufacturing process…..in detail explanation. I doubt we will be getting an answer too soon. Well, in part this seems to be hype. Sure, when it comes to battery cells, the production line is more complex than the finished cells. That applies to a great many products, perhaps most things that are manufactured. Seems to me he’s vastly oversimplifying the challenges of manufacturing, and vastly overstating how much room there is for improvement. But perhaps Elon will prove me wrong and show how much efficiency there is to be gained with his approach. Elon has said this about both the Freemont car manufacturing and Gigafactory battery cell manufacturing processes, but he is also speaking more generally about most manufacturing. Like many of his comments there are tangible elements of truth mixed with insight, hope, and hyperbole. He has also spoken about artificial intelligence and bringing more of the “Silicon Valley” processes to car manufacturing and now battery cell manufacturing. Just like Tesla’s continuous improvement philosophy was new to the business. He sees that combined with the rapid advancement in many technologies such as materials, sensors, automation, etc as a path for continuous future improvements in addition to some they’ve already made and others they are already working on. Space x? Mars? I don’t think so. Mars is not the goal… The goal is a gigantic cube shaped factory in space. (a sphere would also be nice but has drawbacks) imagine that gigafactory with what (too lazy to calculate 100-1000 stories filled with borg (those who work…)).